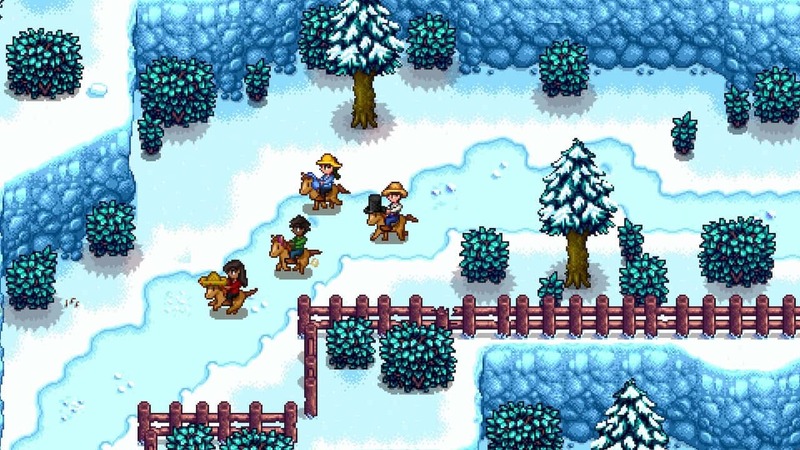 Chucklefish and ConcernedApe have announced that the Stardew Valley Multiplayer Update will be made available on Nintendo Switch this week. The update can be downloaded worldwide on Wednesday 12th December, and has been developed by Chucklefish programmer Tom Coxon, Stardew Valley creator ConcernedApe and implemented on the portable home console by Sickhead Games. Once updated, you will have the chance to invite as many as three players to join you to work on the farm – whether that be starting from scratch or continuing a single player save. It will also have voice chat support, or, if you prefer, you can use a new chat box to communicate with text and emojis. Stardew Valley is now available on the Nintendo eShop for Nintendo Switch worldwide. 4 Player Farming – Invite 1-3 players to join you as partners down on the farm, either starting from scratch or diving in from a single player save. Work Together – Each player lives in their own cabin on the host farm as you work together to achieve common goals such as farming, mining, fighting, fishing, foraging and festival participation. Voice Chat, Chat Box & Custom Emojis – Communicate using Nintendo Switch voice chat support or the new chat box feature with coloured text and nearly 200 custom Stardew Valley emojis. Multiplayer Marriage – Players can choose to woo Pelican Town’s NPCs, or craft a wedding ring to propose to a fellow player. As the Host, you can also divorce or ban players on your farm by demolishing their cabins. Scalable Difficulty – As more hands are better than one, players will be able to scale profit margin or produce sold to change the difficulty level of a multiplayer farm. Winter Market Festival – For 3 days in Winter a traveling festival will visit Pelican Town, where farmers can come and go as they please to purchase unique items, enjoy live entertainment and more! Added Character Cutscenes – You can now encounter new character events, including some secret events triggered by certain conditions. Horse Hats – Whether it’s a sombrero, a sailor hat or fedora, your horse can now wear it!